Issue: The German health care system resembles that of the United States in important ways — it is financed by multiple private payers and relies principally on negotiation rather than regulation to establish prices. New drugs that offer minimal benefits compared with existing alternatives within a therapeutic class are subject to reference pricing; those with incremental benefits are subject to price negotiations. Together, the reference and negotiated pricing systems have held German prices substantially below U.S. equivalents. Goal: To describe the German reference-pricing system and compare it to tiered formularies and consumer cost-sharing in the United States. Methods: Document review and interviews with leaders in payer, policy, and pharmaceutical industry organizations in Germany. Key Findings and Conclusions: The German pharmaceutical pricing system uses modest levels of consumer cost-sharing to influence consumers’ choices for drugs with therapeutically equivalent alternatives. Manufacturers are free to set the prices of their products, but insurers will not pay more for a new drug than for its comparators unless it offers an additional clinical benefit. For drugs covered by reference pricing, the insurers’ payment maximum is set at a level that ensures sufficient choices of low-priced options. These models offer an alternative to the U.S. system of tiered formularies. In reference pricing — a component of health insurance design — a health care purchaser establishes a maximum payment it will contribute toward covering the price of a drug. It is used when there is a wide variation in the prices for therapeutically similar products. The payment limit is set at the minimum, median, or other point along the range of drug prices within a therapeutic class. If a patient’s physician prescribes a drug with a price at or below the reference limit, the patient pays only a modest copayment. If a more expensive option is selected, he or she pays the copayment plus the full difference between the reference limit and the price of the chosen product. Reference pricing offers several advantages over the most commonly used insurance designs in the United States, such as annual deductibles and coinsurance, which expose consumers to financial obligations without providing an affordable option or guidance on how to select products offering the best value. To date, however, reference pricing has been applied only by a limited number of purchasers and only to drug classes that feature multiple generic or therapeutically equivalent alternatives. For these therapeutic classes, it can reasonably be assumed that all products work similarly. Purchasers can limit their payments to the level charged for the cheaper products in each class and patients desiring a higher-priced option reasonably can be required to pay the difference themselves. Patients with physician-identified clinical needs for higher-priced options can be granted an exception. In its efforts to improve the effectiveness and efficiency of pharmaceutical purchasing, the U.S. can learn from Germany, which manages traditional drugs using reference pricing and novel drugs using comparative-effectiveness pricing. Germany has developed evidence-based methods to assess the clinical benefit of new products, establish reference-based payments for drugs that do not offer incremental benefits over existing products, and negotiate new prices for drugs that do offer incremental benefits.1 This approach enjoys considerable social legitimacy as a mechanism for ensuring patient access while moderating payer expenditures. In Germany, reference pricing falls within an institutional system that features publicly regulated and accountable associations of insurers, physicians, and other stakeholders. Statutory and case law establish the rules governing interactions among these entities, and the Ministry of Health continuously monitors and supports their processes. But the government does not directly assess the comparative clinical benefit of new drugs or negotiate their prices. In this regard, it resembles the U.S. framework more than other European systems where the heavy lifting in pharmaceutical cost control is done directly by governmental payers. The German institutional framework does differ from its U.S. counterpart in important respects. The organization that assesses the comparative clinical performance of new drugs, the Federal Joint Committee (GBA), consists of representatives of the national insurance, physician, and hospital organizations. Patient advocacy organizations have nonvoting seats on the board. The GBA, in turn, delegates the clinical evaluation of new drugs to a privately governed but publically accountable entity, the Institute for Quality and Efficiency in Health Care (IQWiG). IQWiG bases its evaluations on: dossiers submitted by manufacturers, which include a systematic review of the incremental benefit of the drug; the clinical trials for initial market authorization by the European Medicines Agency, as well as other clinical trials; reports by technology assessment agencies in other nations; and other available evidence. GBA then makes its official assessment of each drug’s contribution based on the IQWiG study, further input from the manufacturers, and follow-on testimony at public meetings. The GBA assessments are used by the umbrella organization of Sickness Funds, the GKV-SV. The GKV-SV works within a statutory and regulatory framework that assigns it special rights and responsibilities, and interprets its role as negotiating the best prices from the point of view of the health system, and not merely that of its constituent insurers. In the German pharmaceutical system, new drugs are assessed and priced relative to existing treatments for the same conditions. Drugs that offer additional clinical benefits are paid higher prices; reference pricing is applied to new drugs with clinical performance similar to products already on the market. Comparative-effectiveness pricing applies to new products that perform better than their comparators. All drugs authorized for market access by the European Medicines Agency (EMA) are immediately available after launch for physicians to prescribe and patients to use. The manufacturer unilaterally sets the new drug’s price at time of launch and is reimbursed in full at that price for the drug’s first year. During this first year, an assessment is conducted of the drug’s comparative clinical safety and efficacy by the Federal Joint Committee (GBA), a self-governing but publicly accountable entity representing associations of nongovernmental insurers (also known as “Sickness Funds”), physicians, and hospitals. The GBA makes several important decisions regarding the assessment of each drug’s incremental benefit, with input from the Institute for Quality and Efficiency in Healthcare (IQWiG), the pharmaceutical manufacturer, relevant medical associations, patient advocacy organizations, and other interested entities. First and often most importantly, GBA decides which drug will be used as the comparator against which the new product is to be assessed; a drug treating multiple indications may have multiple comparators. If the new drug is found to offer incremental benefits, its price will be negotiated upwards from the comparator’s price, and so the manufacturer has an interest in having the GBA select a high-priced comparator. However, if GBA picks as the comparator a drug with high price but also high efficacy, the new drug faces a more difficult challenge in demonstrating incremental benefit. A finding of no incremental benefit leads to the drug being assigned to a therapeutic class subject to reference pricing. All products are reimbursed at a level based on the lowest prices charged within the class, if it falls within a therapeutic class for which reference prices have been established. If the new drug is found not to offer an incremental benefit but also does not fall into a reference-priced therapeutic class, its price is subject to negotiation with the proviso that the negotiated price not exceed that of its comparator drug. Second, the GBA chooses the metrics that will assess the new drug’s benefit. These metrics may differ from those used by the EMA, the European equivalent of the U.S. Food and Drug Administration (FDA), in its review of the drug for initial market authorization and for which the manufacturer has conducted clinical trials. In some cases, GBA has rejected metrics acceptable to EMA, such as “progression free survival” for cancer drugs, as it deems them not relevant to the patient’s quality of life. Progression free survival indicates how many months the patient survives posttreatment without an increase in the size of his or her tumors. This metric is correlated with the more important overall survival metric, which indicates the number of months the patient remains alive posttreatment, but is often not correlated with patient quality of life. In other cases, GBA has required that pharmaceutical firms provide metrics that EMA does not require, principally quality-of-life indicators such as change in pain and nausea. The GBA delegates the clinical evaluation of the new drug to IQWiG,3 which considers the portfolio of evidence used for market authorization by EMA plus other studies conducted by the manufacturer. The final assessment of the drug’s benefit then is decided by the GBA. Drugs can be judged by the GBA to offer a major, substantial, minor, positive but nonquantifiable, or no incremental benefit, relative to the comparator treatment. The nonquantifiable benefit is used when the drug is considered likely to offer incremental benefit but lacks sufficient evidence for a confident judgment of the scale. Orphan drugs, which often have no direct comparator and for which the clinical evidence may be based on very small patient samples, usually are awarded a nonquantifiable benefit. The GBA also evaluates the strength of the available evidence (weak, moderate, or strong). The clinical benefit of a drug can be reassessed by GBA in response to changes in the available evidence, sometimes triggering a renegotiation of the price. Patients must pay out of pocket the difference between the price set by the manufacturer and the reference-based reimbursement limit set by the purchaser organization. Many patients are unwilling to contribute out of pocket and prefer drugs priced below the reference limit and their physicians will prescribe drugs at or below the limit. Of products subject to reference pricing, approximately 84 percent are priced by their manufacturers at or below the reference price limit and therefore not subject to additional cost-sharing.5 These products make up 92 percent of all prescriptions made for reference-priced drugs. Manufacturers can submit new prices up to twice a month for drugs in the reference pricing system. The umbrella organization of insurance firms is required to update the therapeutic classes every quarter and the payment limits at least annually. Manufacturers are permitted to lower their prices to the reference limit to avoid the otherwise inevitable reduction in sales volume; many do. For drugs included in the reference pricing system, patients may be required to pay additional copayments, depending on which drug they select in consultation with their physicians. Patients selecting a drug priced above the reference maximum for their class contribute a copayment plus the difference between their drug’s price and the reference maximum. These extra copayments do not count toward the patients’ annual out-of-pocket cost-sharing maximum. However, the extra copayments are modest, since most of the drugs included in the reference pricing system are older, generic medications with typically low prices. For drugs not included in the reference pricing system, German health insurers require patients to pay the cost-sharing amount only. If a new drug is judged by the GBA to offer an incremental benefit over existing treatments, it is referred to the GKV–SV for price negotiations with the manufacturer. The insurer umbrella association uses the GBA’s assessment of clinical benefit, as well as the prices of the comparator drug, therapeutically similar medications, and prices charged in other European nations to negotiate a discount off the new drug’s launch price. Some drugs are judged by the GBA not to offer an incremental benefit yet do not fall into an existing reference-priced therapeutic class, as there must be at least three therapeutically equivalent drugs to constitute a class for reference pricing. These drugs also have their prices negotiated between the manufacturer and the insurer association, but with the proviso that the price of the new drug cannot exceed that of the comparator product chosen by the GBA. The German system uses modest levels of cost-sharing as an instrument to influence consumer choices for drugs with therapeutically equivalent alternatives. However, it does not apply cost-sharing to new drugs that lack alternatives. Comparative-effectiveness pricing is used for new specialty medications that offer clinical benefits over existing treatments. Manufacturers are free to set the prices of their products, but insurers will not pay more for a new drug than for its comparators unless it offers an additional clinical benefit. For drugs covered by reference pricing, the insurers’ payment maximum is set at a level that ensures sufficient choices of low-priced options. These models offer an alternative to the U.S. system of tiered formularies. In the United States, the level of cost-sharing and the resulting financial burden on patients is high, especially for patients with complex medical conditions. U.S. payers often impose modest copayments on low-cost drugs with many direct substitutes but onerous coinsurance on high-cost drugs with few substitutes. Coinsurance does not point the patient toward the most cost-effective drug choices. In contrast, insurance designs built on reference pricing identify drugs that are priced below the insurer’s payment maximum and require only minimal cost-sharing. When most hospitals close, it’s plain to see. Equipment and fixtures are hauled out and carted away. Doctors and nurses leave and buildings are shuttered, maybe demolished. But another fate befalling U.S. hospitals is almost invisible. Across the country, conglomerates that control an increasing share of the market are changing their business models, consolidating services in one regional “hub” hospital and cutting them from others. In recent years, hospitals across the country have seen their entire inpatient departments closed — no patients staying the night, no nursery, no place for the sickest of the sick to recover. These facilities become, in essence, outpatient clinics. Hospital executives see these cuts as sound business decisions, and say they are the inevitable consequence of changes in how people are using medical services. But to patients and local leaders who joined forces with these larger health networks just years ago, they feel more like broken promises: Not only are they losing convenient access to care, their local hospitals are also getting drained of revenue and jobs that sustain their communities. In 2015, the most recent year of data, these service reductions accounted for nearly half of the hospital closures recorded around the country, according to the Medicare Payment Advisory Commission. (By MedPac’s definition, the loss of inpatient wards is equivalent to closure.) These data do not capture more discreet closures of surgical and maternity units that are also happening at local hospitals. And the trend doesn’t just affect nearby residents. It represents a slow-moving but seismic shift in the idea of the community hospital — the place down the street where you could go at any hour, and for any need. Does the need for that hospital still exist, or is it a nostalgic holdover? And if it is still needed, is it economically viable? The effort to scale back inpatient care is occurring within some of the nation’s most prestigious nonprofit hospitals. Mayo Clinic announced last summer that it would cease almost all inpatient care at its hospital in Albert Lea. The health network said it would keep the emergency department open, but send most other patients to Austin, 23 miles east. In Massachusetts, sprawling Partners HealthCare said it will shut the only hospitalin Lynn, a city of 92,000 people near Boston, and instead direct patients to its hospital in neighboring Salem. Only urgent care and outpatient services will remain in Lynn. And in Ohio, Cleveland Clinic has made similar moves. In 2016, it closed its hospital in Lakewood, a densely packed Cleveland suburb. It is replacing the hospital with a family health center and emergency department. The cuts follow a period of rapid consolidation in the health care industry. Of the 1,412 hospital mergers in the U.S. between 1998 and 2015, nearly 40 percent occurred after 2009, according to data published recently in the journal Health Affairs. As large providers have expanded their networks, they have also gained inpatient beds that are no longer in demand — thanks to improved surgical techniques and other improvements that are shortening hospital stays. Hence the closures. But the hollowing-out of historic community hospitals has surfaced fundamental tensions between providers and the cities and towns they serve. Residents are voicing frustration with large health networks that build expensive downtown campuses, charge the highest prices, and then cut services in outlying communities they deem unprofitable. Health scholars also note a growing dissonance between the nonprofit status of these hospitals and their increasing market power. While the nonprofits continue to claim tens of millions of dollars a year in tax breaks to serve the sick and vulnerable, some are functioning more like monopolies with the clout to shift prices and services however they wish. The financial upheaval in community hospitals is driven by sweeping changes in the delivery of care. Procedures and conditions that once required lengthy hospitalizations now require only outpatient visits. At Mayo Clinic, Dr. Annie Sadosty knows this evolution well because it roughly traces her career. She uses appendectomies as an example. Twenty-five years ago, when she was in medical school, the procedure was performed through a 5-inch incision and resulted in a weeklong hospitalization. Today, the same procedure is done laparoscopically, through a much smaller incision, resulting in a recovery time of about 24 hours. “Some people don’t even stay in the hospital,” Sadosty said. Something similar could be said for a wide range of medical procedures and services — from knee replacements to the removal of prostate glands in cancer patients. Hospital stays are either being eliminated or reduced to one or two days. And patients who were once routinely admitted for conditions like pneumonia are now sent home and managed remotely. That evolution has cratered demand for inpatient beds. In 2017, the Medicare Payment Advisory Commission noted that hospital occupancy is hovering around 62 percent, though the number of empty beds varies from region to region. In Albert Lea, Mayo administrators said the changes at the hospital will only impact about seven inpatients a day. Currently, caring for those patients requires nursing staff, hospitalists, and other caregivers, not to mention overhead associated with operating a hospital around the clock. The financial result is predictable: Hospital executives reported that jointly Albert Lea and Austin hospitals have racked up $13 million in losses over the last two years. With inpatient demand declining, hospital administrators decided to consolidate operations in Austin. The decision meant the removal of Albert Lea’s intensive care unit, inpatient surgeries, and the labor and delivery unit. Behavioral health services will be consolidated in Albert Lea. Cleveland Clinic described similar pressures. Dr. J. Stephen Jones, president of the clinic’s regional hospital and family health centers, said use of inpatient beds has declined rapidly in Lakewood, dropping between 5 and 8 percent a year over the last decade. By 2015, 94 percent of visits were for outpatient services — a change that was undermining financial performance. The hospital lost about $46.5 million on operations that year, according to the clinic’s financial statements, and its aging infrastructure was in need of repair. “Hospitals are very expensive places to run,” Jones said. “Lakewood was losing money on an operating basis for at least five years” before this decision was made. But the service cuts in Albert Lea, Lynn, and Lakewood — backed by nearly identical narratives from hospital executives — provoked the same reaction from the communities surrounding them. Residents accused the hospital chains of putting their bottom lines above the needs of patients. Even if these individual hospitals were losing money, they said, nonprofits have an overriding mission to serve their communities. The fight over Lakewood Hospital has persisted for more than three years, spawning lawsuits, an unsuccessful ballot referendum to keep the hospital open, and even a complaint filed by a former congressman to the Federal Trade Commission. None has caused Cleveland Clinic to reverse course. Meanwhile, in Albert Lea, opponents to the service cuts have taken matters into their own hands: With Mayo refusing to back down, they are hunting to bring in a competitor. A market analysis commissioned by Albert Lea’s Save Our Hospital group concluded that a full-service hospital could thrive in the community. The report included several caveats: A new provider would need to attract new physicians and capture market share from Mayo, a tall order in a region where Mayo is the dominant provider. But members of the group said the findings directly contradict Mayo’s explanations to the community. They argue that, far from financially strained, the health system is simply trying to increase margins by shifting more money and services away from poorer rural communities. 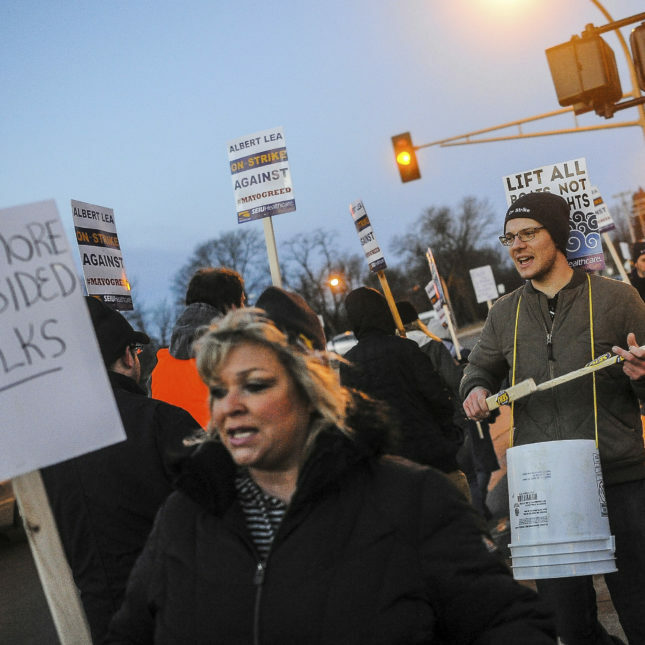 “They don’t care what happens in Albert Lea,” said Jerry Collins, a member of the group. “Mayo cares what happens with its destination medical center.” He was referring to Mayo’s $6 billion project — funded with $585 million in taxpayer dollars — to expand its downtown Rochester campus and redevelop much of the property around it. Sensitivity to Mayo’s service reductions is heightened by its control of the market in Southeastern Minnesota. It is by far the largest provider in the region and charges higher prices than facilities in other parts of the state. A colonoscopy at Mayo’s hospital in Albert Lea costs $1,595, compared to $409 at Hennepin County Medical Center in Minneapolis, according to Minnesota HealthScores, a nonprofit that tracks prices. The gap is even bigger for a back MRI: $3,000 in Albert Lea versus $589 at Allina Health Clinics in Minneapolis. The community’s loud resistance has drawn the attention of the state’s attorney general and governor, as well as U.S. Rep. Tim Walz, who has begun a series of “facilitated dialogues” between Mayo and its opponents in Albert Lea. So far, the dialogue has failed to forge a compromise. Mayo is proceeding with its plans. It has relocated the hospital’s intensive care unit to Austin, and inpatient surgeries and labor and delivery services are planned to follow. Mayo executives reject the notion that they are abandoning Albert Lea or compromising services. The hospital plans to renovate the Albert Lea cancer wing and beef up outpatient care, improvements executives say have gotten lost amid the criticism. As for inpatient care, they say, Mayo must consider quality and safety issues. With the hospital in Albert Lea only admitting a handful of patients a day, caregivers’ skills are likely to diminish, potentially undermining quality. They also cited recruiting challenges. Efforts to regionalize medical services also pose a new challenge: Can hospitals transport patients fast enough — and coordinate their care well enough — to ensure that no one falls through the cracks? It is a question that will face stroke victims and expectant mothers who now must drive greater distances, sometimes in treacherous conditions, to make it to the hospital on time. In Massachusetts, Partners HealthCare will face that test as it moves inpatient and emergency care from Union Hospital in Lynn to North Shore Medical Center in Salem. The hospitals are less than 6 miles apart. However, the short distance belies the difficulty of coordinating service across it. Ambulances will have fewer options in emergencies. And if residents drive themselves to the wrong place in a panic, precious time gets wasted. Dr. David Roberts, president of North Shore Medical Center, said the health system is working to educate patients to ensure that they go to the correct facility. He added that Partners already conducts risk assessments of patients with severe medical problems, and transfers them to hospitals with higher-level care when necessary. Still, opponents of the closure say it raises a broader concern about whether Partners’s actions are driven by a financial strategy to shift care away from low-income communities with higher concentrations of uninsured patients and those on Medicaid, which pays less for hospital services than commercial insurers. Union Hospital serves a largely low-income population. Roberts said the consolidation at North Shore Medical Center in Salem has nothing to do with the income level of population in Lynn. He said the hospitals serve “identical” mixes of patients with government and commercial insurances. “Our payer mix at both hospitals is adverse,” he said. “And despite that, Partners invested $208 million” to support the expansion of North Shore Medical Center. Meanwhile, Mayo is proceeding with its changes in Albert Lea. Executives have assured Albert Lea residents that they will receive the same level of care for emergency services and upgraded facilities for outpatient care. But some community members said they are already noticing problems with Mayo’s regionalization. One local pharmacist, Curt Clarambeau, said he can’t get timely responses to reports of adverse drug reactions. A call to the hospital in Albert Lea results in several phone transfers and no immediate response. Don Sorensen, 79, said he’s also had trouble getting access to doctors at the hospital in Albert Lea. He said began to suffer from severe knee pain in November, but couldn’t get an appointment. His wife was put on hold for 40 minutes before learning the earliest appointment was still several days away. At the suggestion of his RV repairman, Sorensen called a clinic in Minneapolis and got an appointment the same day. His wife, Eleanor, drove him, and he ended up with a brace, a prescription, and another follow up appointment. The nation’s top cancer doctors are more likely to be excluded from low-cost health insurance plans offered on the nation’s individual market, potentially crimping access to the highest-quality care for Americans when they need it most, a new study found. The individual exchanges, opened in 2014 as part of the Affordable Care Act, often include lower-cost policies that limit the number of physicians available to members as a way to cut costs. Those “narrow networks” are becoming more prevalent in Obamacare, as insurers seek ways to offer cheaper coverage, according to McKinsey & Co. The study was published in the Journal of Clinical Oncology and examined data from 2014. The study offers a sense of the tradeoffs Americans face when buying health-care coverage on their own: Plans with lower premiums often get costs down by limiting choices of doctors and hospitals, asking patients to pay more out of pocket, or some combination of the two. It’s an issue patients are increasingly facing in insurance provided by employers, too, and one they’d likely continue to deal with under Republican plans to replace Obamacare. The current GOP proposals offer less financial help for people to buy coverage and could shift more people into lower-cost plans. For the study, researchers from the University of Pennsylvania analyzed data on 23,442 oncologists in the U.S., evaluating how often doctors affiliated with National Cancer Institute-designated centers were covered by lower-cost insurance plans. The University of Pennsylvania is an NCI-designated cancer center. Oncologists working at the U.S.’s 69 NCI facilities in the U.S., which offer access to scientific research and are known for their handling of complex cases, were twice as likely to be excluded from plans with the narrowest networks, according to the study. The Obama administration had been working to make it easier for people to figure out whether individual doctors and drugs were covered by their Obamacare plans by looking up such information online. It’s harder for consumers to determine the comprehensiveness of an insurance plan’s network, however, and so far there’s only been a limited effort to require plans to disclose the overall size of their networks. Regulating insurers’ networks is largely left up to the states. The Trump administration has said it will defer to states rather than conduct its own reviews, for the most part. Health plans have procedures that let patients who need specialized care get to the appropriate doctors, according to a statement from the industry group America’s Health Insurance Plans. The group noted that the study dealt with coverage for individual physicians, not for the facilities themselves. According to the researchers, doctors at NCI-designated cancer centers, such as Memorial Sloan-Kettering in New York, Dana-Farber in Boston, MD Anderson in Houston and the University of Pennsylvania, may be excluded from the narrow networks because of their cost. Because of the doctors’ status, the centers may be more able to negotiate higher reimbursement rates for their services. They may also attract more complicated, and thus costly, patients. Excluding them could help insurers control expenses at the price of limiting access to high-quality, specialized care, the researchers said. The Penn researchers analyzed 248 insurance networks across the U.S. operating in areas with NCI-designated centers. They found that one in every three significantly limited the number of oncologists in their insurance plans. Of all the cancer doctors who were part of those narrow networks, 17 percent worked at NCI centers. Of all the doctors who were excluded from those plans, 35 percent participated at NCI centers. The discrepancy wasn’t seen in broader insurance networks. 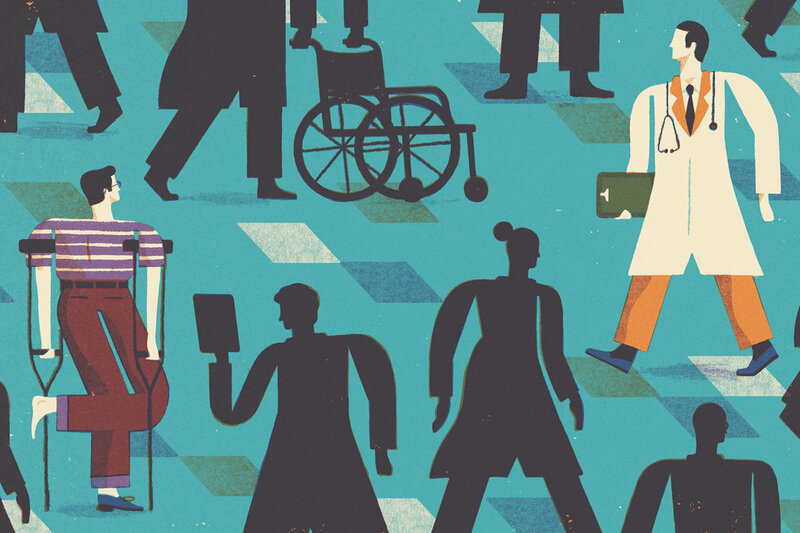 In those plans, 34 percent of included oncologists were affiliated with NCI centers, compared with 29 percent of those cancer doctors who were excluded, according to the study. Narrow networks: savings at what cost? You probably chafe a bit every time you learn that a certain doctor or hospital isn’t part of your insurance network. Narrowing the scope of your network helps insurers save money. They can drive hard bargains with doctors and hospitals to get lower prices and walk away from higher-priced ones. Increasingly, insurers are offering narrow network plans. Would you enroll in one? So long as quality doesn’t suffer, consumers should welcome the lower premiums they may offer. Researchers at the Leonard Davis Institute at Penn analyzed the relationship between network size and premiums for plans offered in the Affordable Care Act marketplaces. Plans with very narrow networks (covering care by less than 10 percent of physicians) charged 6.7 percent lower premiums than plans with much broader networks (covering care by up to 60 percent of physicians). This translates into an annual savings for an individual of between $212 and $339, depending on age and family size. For a young family of four, the savings could reach nearly $700 per year. One way plans might save money could make it harder for patients to get care — so that they get less of it. Narrow network plans may do this if they don’t cover enough nearby providers, with the ones they do cover too busy to take new patients in a timely fashion. Clearly this would be especially problematic if appointments with one’s preferred primary care doctor are hard to obtain. Are today’s narrow network plans actually doing this? Until recently, we had no data to answer this question. But two studies published earlier this year — one focused onMassachusetts, the other on California — provide some insight. People might be forgiven for thinking that the Affordable Care Act is the federal government’s boldest intrusion into the private business of health care. But few know about a 70-year-old law that is responsible for the construction of much of our health system’s infrastructure. The law’s latest anniversary came and went without much notice in August. The Hill-Burton Act was signed into law by President Harry S. Truman on August 13, 1946 — and its effect on health care in the U.S. was nothing short of monumental. Perhaps more importantly, it stands as an example, warts and all, of how a bipartisan Congress can forge compromises to bolster American infrastructure and boost the well-being of our people. 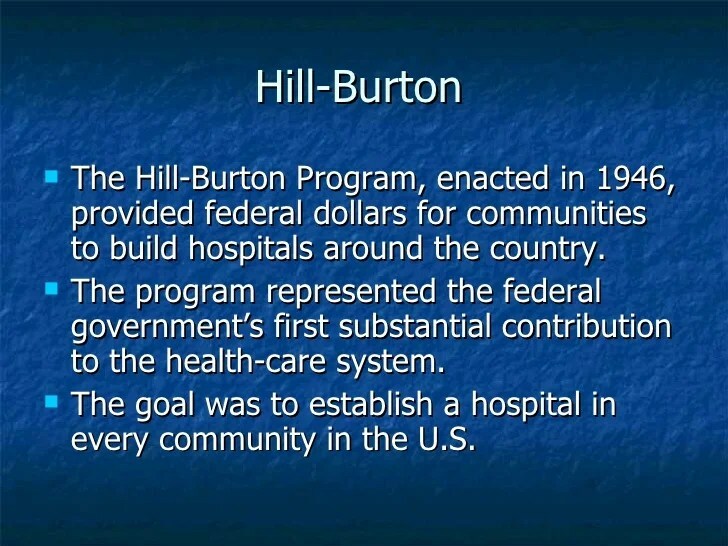 Known formally as the Hospital Survey and Construction Act, Hill-Burton started as a Truman initiative. In November 1945, only two months after the official end of World War II, he gave a speech to Congress outlining five goals to improve the nation’s health. The first and least controversial of these called for constructing hospitals and clinics to serve a growing and rapidly demilitarizing population. Hill-Burton provided construction grants and loans to communities that could demonstrate viability — based on their population and per capita income — in the building of health care facilities. The idea was to build hospitals where they were needed and where they would be sustainable once their doors were open. Over the subsequent decades, new facilities sprang up all around the country, including many in the 40 percent of U.S. counties that lacked hospitals in 1945. By 1975, Hill-Burton had been responsible for construction of nearly one-third of U.S. hospitals. That year Hill-Burton was rolled into bigger legislation known as the Public Health Service Act. By the turn of the century, about 6,800 facilities in 4,000 communities had in some part been financed by the law. These included not only hospitals and clinics, but also rehabilitation centers and long-term care facilities. In 1997, this type of direct, community-based federal health care construction financing came to an end. However, numerous Hill-Burton clinics and hospitals still exist around the country, specifically financed by a part of law to provide care to those unable to afford it. A month after enactment of the law, Truman, a Democrat, appointed Republican Sen. Burton to the Supreme Court in a bipartisan gesture that doesn’t seem imaginable in today’s polarized political landscape. And consider this: Burton was unanimously approved by the entire Senate the same day he was appointed. With no committee hearings! He joined the court the very next day. As we approach the election this fall, it seems like the news media report on little else. Unfortunately, too little news coverage addresses health care reform. This is ill-advised because there is still much to be done to improve the cost, quality, and access for patients within the US health care system. In this post, I will attempt to cover most of the major issues related to health care coverage that US consumers face. In a previous piece I wrote for the JAMA Forum, just before the last presidential election, I discussed how health care reform is all about tradeoffs. For example, one way to make an insurance plans cheaper is to offer narrow networks (reducing access to high-cost services or allowing access only to physicians who agree to accept lower payments in return for the promise of higher volume). That’s a tradeoff. Community ratings and government regulation lead to improved access for some but fewer options for carriers (worse access). Weak mandates allow for more freedom in deciding whether to purchase insurance but lead to increased rates for others and fewer carriers participating. We should not lose sight of what has improved. An additional 20 million US residents who lacked health coverage are now insured. Spending has slowed to below what was predicted. But there is still much work to do. Calling for blanket repeal of the ACA and a return to the status quo is not an improvement. But failing to recognize shortcomings in reform and working to ameliorate them would be a failure as well. The merger of health insurance giants “would significantly compromise market competition in the health insurance industry and threaten health care access, quality and affordability,” the president of the AMA said as the group released new analyses of the mergers. In the analysis, the AMA claims the Anthem-Cigna merger would diminish competition in 121 metro areas across 14 states, and that the Aetna-Humana merger would diminish it in 51 metro areas across 15 states. The studies also note an “unprecedented lack of competition” that already exists in many states, the AMA says.